The 2018 Green Gift Guide is here, just in time for the holidays! We’ve found the perfect eco-friendly, sustainable, and ethically made gift for each person on your list. Here’s to a healthy and environmentally friendly holiday season! Welcome to the first annual Fork in the Road Green Gift Guide! 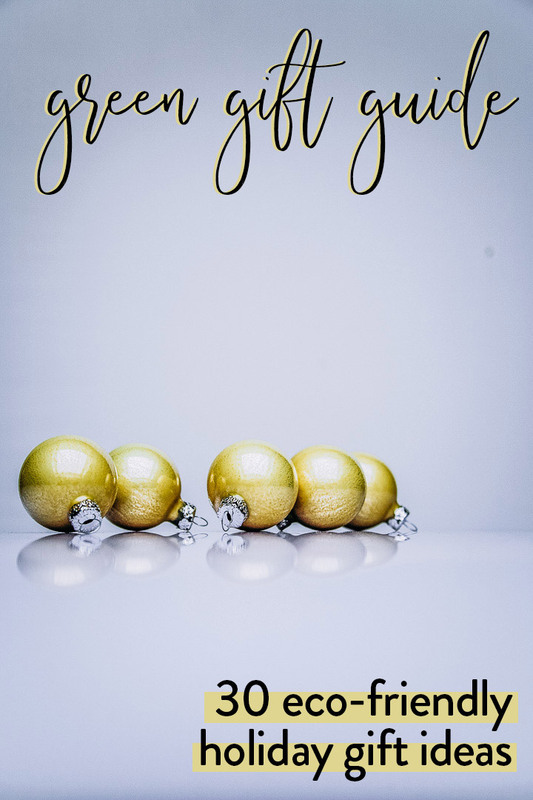 The holiday season is fast approaching and, I don’t know about you, but I am definitely a procrastinator when it comes to gift shopping (and gift giving). Another gift-giving challenge I have during the holidays is finding gifts that are ethically and sustainably made. I don’t know about you, but when I decided to adopt a green living lifestyle I found it challenging to find gifts that fit my eco-friendly expectations. Year after year I struggle to find gift ideas that align with my personal values, but also don’t break the budget. But never fear, green living warriors, the 2018 Green Gift Guide is here! Below you’ll find gifts to fit anyone on your list, even that hard-to-shop-for person you can never seem to find something for. Whether you have green eaters, green homebodies, green travelers, or budding eco-warrior kids on your list, we’ve found something you for you. Can’t find the perfect gift for the eco-conscious foodie? Don’t worry, that’s what we’re all about here on Fork in the Road. You may even want to get two of these green eating and green kitchen goodies (one for you, of course!). Reusable produce bags: Forgo the plastic bags when at the farmers market or grocery store and stock up for these mesh produce bags instead. They’re also great for storing fruit, transporting flowers, or as a simple lunch tote for work or school. Queork Cork Wine Sleeve: Think cork is only for wine stoppers? Think again. Queork is a eco-friendly fashion and homegoods brand that uses cork creatively in everything from homegoods, accessories, and even pet products. The eco-foodie on your list will love a their cork kitchen accessories. ChicoBag Mindful Grocer Kit: Keep meaning to switch to reusable bags? This grocery store starter kit includes reusable carrying bags, but also mesh produce bags so you don’t have to use the plastic from the store. GreenPan Eco-Friendly Cookware Set: Did you know many common enameled pots and pans release toxins when overheated? Choosing eco-friendly and healthy cookware is key to reducing these harmful substances, and GreenPan is my favorite brand of responsibly made cookware. Test out their healthy ceramic cookware with a 2-pan set, or splurge and get the whole eco-friendly cookware set. Our Green House: Let’s Get Cooking Eco-Friendly Gift Basket: The foodie-focused gift baskets from Our Green House are the perfect gift for the gastro explorer in your family. 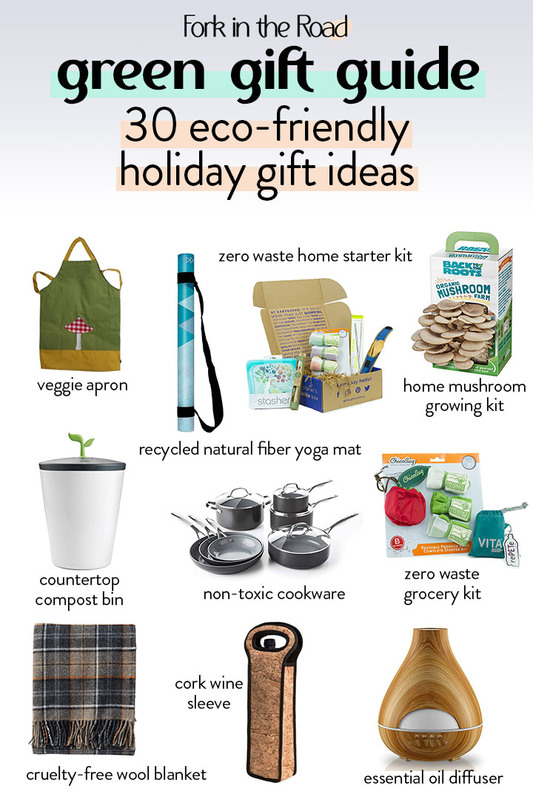 Not sure what to gift the environmentally-conscious domestic dweller? Never fear, we’ve got the perfect gifts for homebodies who love to make their home their eco-sanctuary. Purify My Cleaners Essential Gift Set: The non-toxic soaps, detergents, and hand washes from Purify My are the perfect gift for the eco-conscious clean freak on your list. Eco-friendly Essential Oil Diffuser and Oil Set: For the homebody who makes their home their haven, an essential oil diffuser is a great gift to bring some zen to nights at home. Pair it with a set of eco-friendly essential oils for a little at-home aromatherapy. Chef’n Countertop Compost Bin: Have that friend who hasn’t yet adopted composting? Surprise them with this simple countertop compost system for the holidays and help them turn those food scraps into gold for healthy soils. Love Goodly Curated Cruelty- and Toxin-Free Box Subscription: Give the gift that keeps on giving with this “do no harm” subscription box.Each box has a mix of full size products, focused on nontoxic beauty and skincare, as well as eco-style or home accessories, healthy snacks and wellness products. Earth Hero Zero Waste Starter Kit: Have a friend who wants to live waste-free? This great gift basket of zero waste household goodies.From straws to utensils, this gift box is a perfect way to jump-start the zero waste lifestyle. Pendleton Woolen Works Eco-Wise Throw Blanket: Conventional fabrics are full of acrylic and other fake textiles. Pendleton’s wool throw blankets are made from 100% virgin wool and use naturally-derived dyes. Perfect for cozy nights on the couch with cocoa! Our Green House: Warm Welcome Housewarming Gift Basket: Not sure what to get the person who’d rather stay at home than hit the parties for the holidays? A basket of environmentally-friendly house goodies is the perfect present for those who love to cuddle up indoors. Clueless about what to get for the ethical intrepid traveler? A few simple and sustainable travel goodies will go a long way when you spend a lot of time on the road. Bamboo Tumbler with Tea Infuser: This all-in-one water bottle, coffee thermos, and tea diffuser is made from bamboo, stainless, and is BPA-free. It’s the perfect gift for the girl or guy on the go! Yoga Design Lab Eco Travel Yoga Mat: The jet-setting yogi on your list will love this thin, foldable yoga mat that will easily fit into any carry-on bag. Made from natural tree rubber and recycled bottles, these beautifully-designed mats are a great choice for the environmentally-conscious and active traveler. Haiku’s Travel Bag Set: Looking for travel toiletries bag that isn’t made from harmful materials? This small travel bag is vegan and made from recycled ingredients, and is from a company who commits to fair wages. Something to feel good about! Queork Cork Travel Bag: Handbags made from cork? Yup. Queork is a eco-friendly fashion and homegoods brand that uses cork creatively in everything from homegoods, accessories, and even pet products. The world traveler on your list will love a simple cork crossbody or tote bag. Samsonite Eco-Glide Carry-On: This carry-on suitcase is made with 100% recycled fabrics by the travel bag leader Samsonite. Your jetsetter will fly through airports with this gliding eco-friendly bag. Wonder what to buy for the budding environmentalist in your family? These fun eco-friendly gifts will help them grow into the green warrior they’re meant to be. Our Green House: Kid’s Fruit Apron: Get the little cook in your family a fruit-focused apron! Our Green House has a great selection of foodie kid gifts for the future master chef. Back to the Roots Organic Mushroom Growing Kit: Teach little ones the power of growing your own food with this fun grow-your-own mushroom kit. Just add water and you have delicious organic shrooms! Recycled Colored Pencil and Coloring Book Set: This 100% recycled colored pencil and coloring book set will be the perfect gift for the future famous artist. What’s on your eco-friendly wishlist this season? Do you have any creative homemade gifts to share with the FITR Green Living Community? Leave a comment below and let us know! Thanks for these tips! I am trying to be greener this year and only buy things that my family and friends can reuse and also from good brands. These are great thought starters for my holiday list. It’s definitely a transition to a sustainable home and it doesn’t happen overnight. I’m glad these gift ideas helped, good luck and happy holidays!